The Spartanburg Phillies needed a run and Francisco Tejada did his best to provide it, according to The Gastonia Gaston Gazette. Tejada knocked a double to lead off the sixth, hitting the ball just outside of the reach of the centerfielder, The Gaston Gazette wrote. Tejada's teammates, however, couldn't get him in in a game lost 1-0. Tejada knocked that double in his fourth season as a pro. He played in just one more campaign. He never made AA. 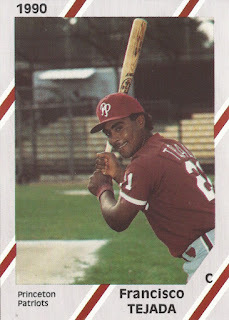 Tejada's career began in 1988, signed by the Phillies as an amateur free agent out of his native Dominican Republic. Tejada started with the Phillies at rookie Martinsville. The catcher played there in 1988 and 1989, getting into 16 games his first year and five his second. He moved to rookie Princeton for 1990. He got into 52 games and hit .238. He hit four home runs and knocked in 29. For 1991, Tejada played at single-A Spartanburg and got one game at high-A Clearwater. In 37 total games, he hit .218. His final pro season came in 1992. He got into 31 games and hit .187.